Do you want a really fun way to quickly prepare breakfast when on a camping trip? 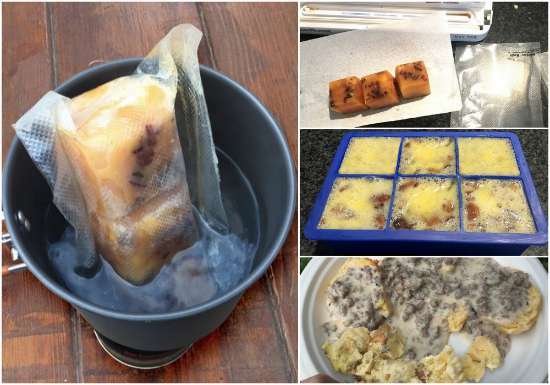 A great option is to make a batch of frozen breakfast bricks that are really easy to cook. The only thing you will need to do is make sure a campfire is available and you have a cooler to keep food cold until it is cooked. Frozen breakfast bricks are similar to an omelet or a quiche. You have a lot of options to consider when you want to prepare a hearty breakfast. The key to this type of meal is using a lot of eggs as you will be filling a lot of ice cube trays. The most important piece of equipment you need to make frozen breakfast bricks is a food sealer. Your bricks are cooked inside the sealed bag by boiling. The result is a hot and steamy breakfast that you are going to really enjoy.